The weather in North Texas is a constant factor in our daily routines, affecting our business lives and budgets — weatherproof roofing can bring you peace of mind as a business owner. The summer utility bills skyrocket every year, and constantly changing winter conditions can cause headaches for businesses, too. Have you ever wondered if there aren’t better options for your commercial roof that would cut these costs — both utility costs and repair expenses? 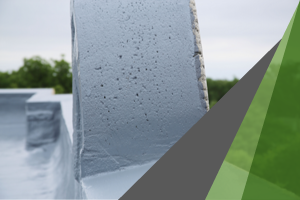 The good news is that you can improve almost any roofing situation with either SPF (spray polyurethane foam) or an elastomeric coating (or a combination of both). One of the biggest problems we face during the North Texas winters is the constant fluctuation of temperatures. We have some unseasonably warm days followed by sharp drops into freezing conditions. Did you know that your building expands and contracts with the changes in temperature? This constant flexing of your roofing material can lead to cracks and leaks at the seams, or at joints around skylights, fixtures, and flashings. Then, you can wind up with a leaky roof and water damage the next time we get a heavy rain. That is, unless you have a flexible weatherproof roofing solution, like SPF or an elastomeric roof coating, that can give and flex with the constant change in winter temperatures. Consider these numbers for a moment. 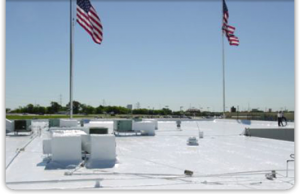 A typical 90-degree summer afternoon (pretty mild here in North Texas) can result in temperatures of up to 200 degrees on a traditional, dark-colored commercial roof. The reflectivity rating of your roof makes a huge difference. The same weather conditions might only reach 130 degrees on a roof using a light-colored elastomeric coating, like the GE Enduris Silicone Roof Coating System. 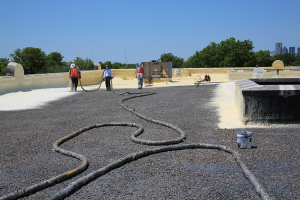 If we combine that reduction in temperature with the maximum insulating properties of a spray polyurethane foam (SPF) roof, you benefit from serious savings on your summer utility bills — as much as 20% on those cooling bills. No claim about saving money is any good without solid evidence — actual proof in the form of case studies where recorded costs and expenditures show more money will stay in your account over time. We tracked one case, which you can read more about here, where we installed 1.5 inches of SPF roofing and an elastomeric roof coating, and then we asked the customer to compare his utility costs to the previous year. 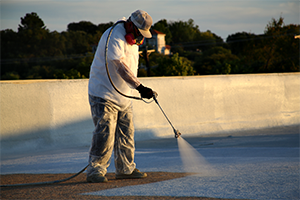 At DFW Urethane, we have actual solutions that save you real money on your overhead costs. 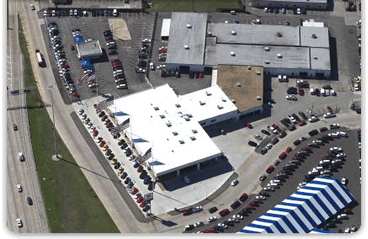 Elastomeric roof coatings, like the GE Enduris Silicone Roofing System, may be the answer for your commercial roofing needs, and an SPF roofing system can be combined with reflective and flexible coatings if your repair or replacement needs require a heavy-duty solution. Each season in North Texas brings its own weather-related challenges, but our weatherproof roofing systems are prepared for any conditions. Repairing current faults, preventing leaks, increasing storm resistance, adding reflectivity, and reducing utility costs are all good reasons to look into a weatherproof roofing system like SPF and the GE Enduris Silicone Roofing System. Whether you need an elastomeric coating to solve problems with your current roofing system or one combined with an SPF roofing system for bigger problems, we have weatherproof roofing solutions for you — contact DFW Urethane here for a free estimate today.